The A9 motorway linking Spain to Italy is 10 minutes from the port. It provides access to the A61 to Toulouse (1H30 driving time), the A7 to Lyon (4 hours) and the A75 to Clermont-Ferrand (4 hours). The Decree N° 2005-11-1422 authorizes the total rolling vehicle weight of an articulated vehicle equipped with a double axle or a combination of a vehicle and a trailer with more than four axles to exceed 40 tons without exceeding 44 tons when operating within the area defined in Article 2 within the boundaries of Port-La Nouvelle, and exclusively for the transport to or from the port, of goods destined to be carried by sea provided such goods are regulated according to the conditions laid down by Decree. See map. Note : on June 19th, 2018, the Spanish Government announced the free access from 2021 of the AP7 motorway connecting Le Boulou to Valencia. •	All terminals are connected to rail. •	A very short distance links the port to the national railway network, which provides quick train management between the port area and the main tracks. •	The development of freight corridors (rail highways) support the freight-oriented European rail network on which transport will be more reliable and more efficient in terms of transit times and capacities. 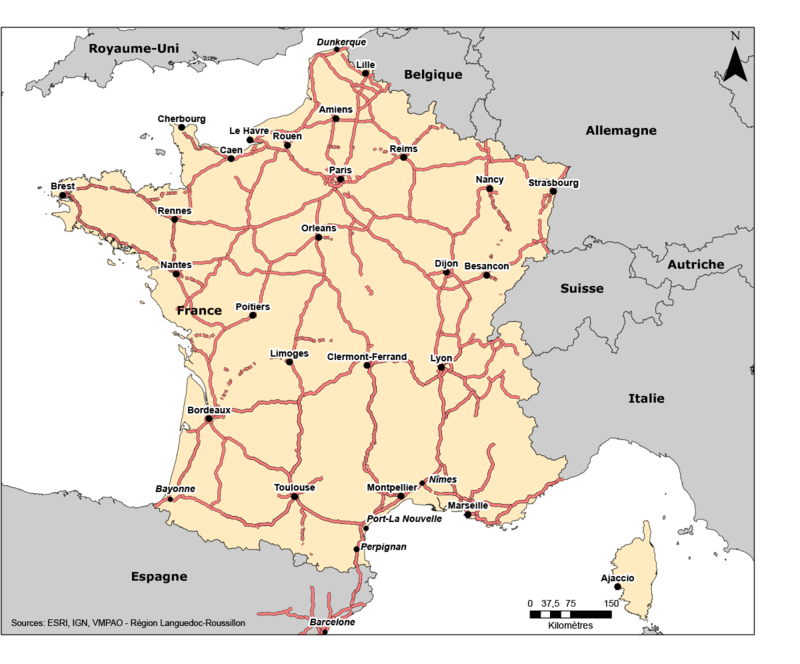 •	The regular investments provided by the Regional Council and SNCF RÉSEAU on the national rail network passing through the OCCITANIE ensure a strong reliability. In addition, the Port Authority has put in place a new management of the port’s rail network, supported by new investments. On January 1st 2016, the Region became the owner of the port railways. Since July 1st 2018, it has delegated the management of this network to a Private Operator in charge of managing rail traffic and maintaining the port network. The selected Private Operator, for the period 2018-2023, is a group of companies (SFERIS, RDT13, ETF & SNCF Réseau) represented by the Company SFERIS. Under the following link, rail carriers will find the reference document detailing the conditions of access to the port and a model of contract for the use of port railways. Railway Carriers will find the conditions of access to the Port area as well as a standard model of the contract for the use of the port’s railways here (website of the Regional Council). Map of the European Rail network: Map of the European rail network.